Join us for this in-depth Massage Retreat where you will learn more massage skills, tantric touch skills and energy healing. Start each day with Taoist Yoga (Chi Kung) & Meditation Instruction. Participate in 2 Massage Classes per day which include lots of practice. Evening discussions and exercises are meant to facilitate a broader understanding of the Tantra & Taoist Concepts we are practicing. Enjoy walks on the land – 60 acres of pristine woodlands; Wood-fired hot-tub and delicious home-cooked organic meals. All with luxurious accommodations. Join an intimate group of men to explore our capacity for nourishing each other with touch, authentic communication and camaraderie as we create community together. Learn and engage in embodiment practices together as we explore the transformative power of Touch, Tantra and Taoist practices. Daily Massage, Tantra and Meditation classes are on site at our guesthouse with plenty of time to practice and work on skills. Morning Chi Kung (Taoist Yoga) and Afternoon Movement Classes following Taoist and Tantra Principles. Other Activities include: Traditional Mexican Sweat Lodge, Group Dinners; Sunset Yoga and Excursions. All massage, movement classes and meditations; 2 meals per day (breakfast and warm lunch) and some evening activities. Guesthouse accommodations included and are based on double-occupancy. We gather January 10-15, 2018 in an ideal retreat spot on Mexico’s southern Pacific Coast. A clothing-optional beach and gay-friendly town with southern- Mexican charm. Great restaurants with fresh, local fare and affordable prices. 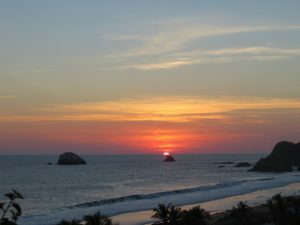 Our guesthouse – La Loma Linda – overlooking the ocean – is a taxi ride from the nearest airport in Huatulco – There are some non- stop flights from Houston to Huatulco. Get to know yourself in new ways and take home transformative practices that have great potential to positively impact your life. Take advantage of the Early- Bird Special on NOW: $1,050 – not including airfare and transfers.